Hi gang! It’s Cindy here and I’m back with some new inspiration for you here on the Lindy’s Gang blog. 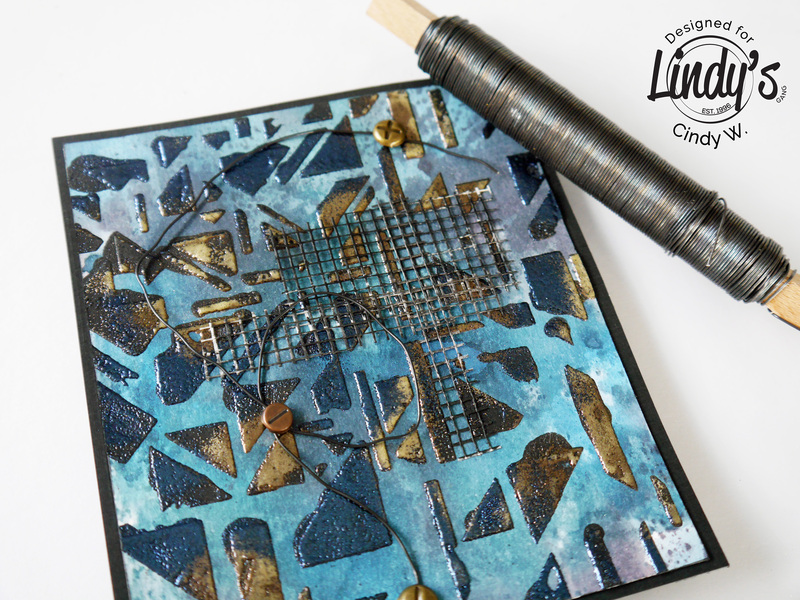 This time I’ve created a card in a steampunk kind of style using some of the most gorgeous colors Lindy’s sprays and embossing powders and I’m going to show you with some step by step photos how you can create one of your own. I started by picking some materials for the card, cardstock, gears, metal pieces etc. I didn’t use all of them but this is what I planned to use ;). 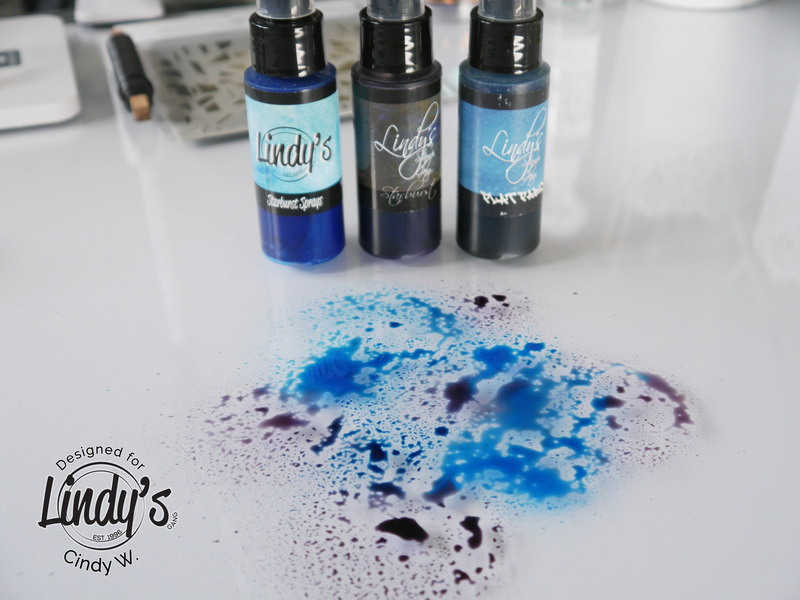 I grabbed two gorgeous blue Lindy’s Gang sprays, Blue Hawaiian Blue and Danny Zuko’s Denim and later on added Screamin’ Banshee Black. I also picked a couple of colors of Embossing powder; Scotch Broom Yellow, Adobe Fire and Midnight Sapphire. First I needed to create a background. I took a piece of Mixed Media paper and sprayed some of the color on my table (I actually use a piece of thick glass to work on, so that’s why I can spray it directly on to my table). Then I took the paper and laid on top. 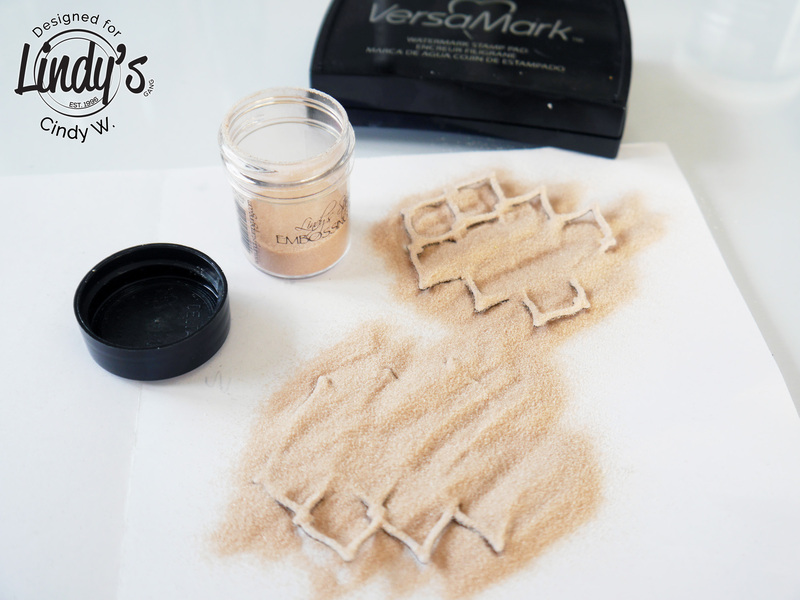 It’s important to dry every layer before adding another one, to prevent the colors to blend too much – ending up with mud instead of a nice color. After finishing the background I took a nice geometric stencil and added black modelling paste. I sprinkled Embossing powder; Scotch Broom Yellow and Midnight Sapphire onto the wet modelling paste and dried with a heat tool. I love the effect of Lindy’s EP on black modelling paste, it’s magical! The paper started to curl a bit because of the moisture and heat, so I decided to glue it on top of the black paper using sticky tape to make sure it’s as flat as possible. I’ve used a nice cutting die and added embossing powder to both of the pieces to create some custom embellishments. I also attached a piece of wire using brads and used some drywall tape, painted black with gesso, to add texture. Using a glue gun to the gears and a small text. Last but not least I used Nuvo Drops to add copper colored pearl drops. I think they look amazing together with the gorgeous blue background created with the blue Lindy’s Gang sprays. Those colors really complement each other. Here’s a close-up photo of the finished card. I’m in love with this color combo and I really like how the embossing powders look on the black paste. The colors look really good together.